These fabulous letter boxes can be personalised and make special gifts for any home owner. Excellent gift item for secretary or office co-workers. Get organized while adding a decorative touch to your home with this handy letter box. The tile can include a name or phrase of your choosing. Keyhole Wall Mount or Free-Standing. 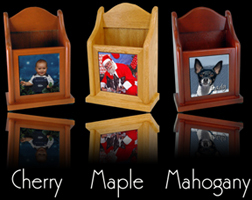 Your source for one of a kind gifts, awards, advertising products! Dog, horse, school & family events, fundraisers. Please save us to your favorites list and check back with us soon, things are happening almost on a daily basis!